I cannot put myself to sleep so I thought of writing a quick Friday's 10 Happy Things post which I have not done in a loooooong time. 1. 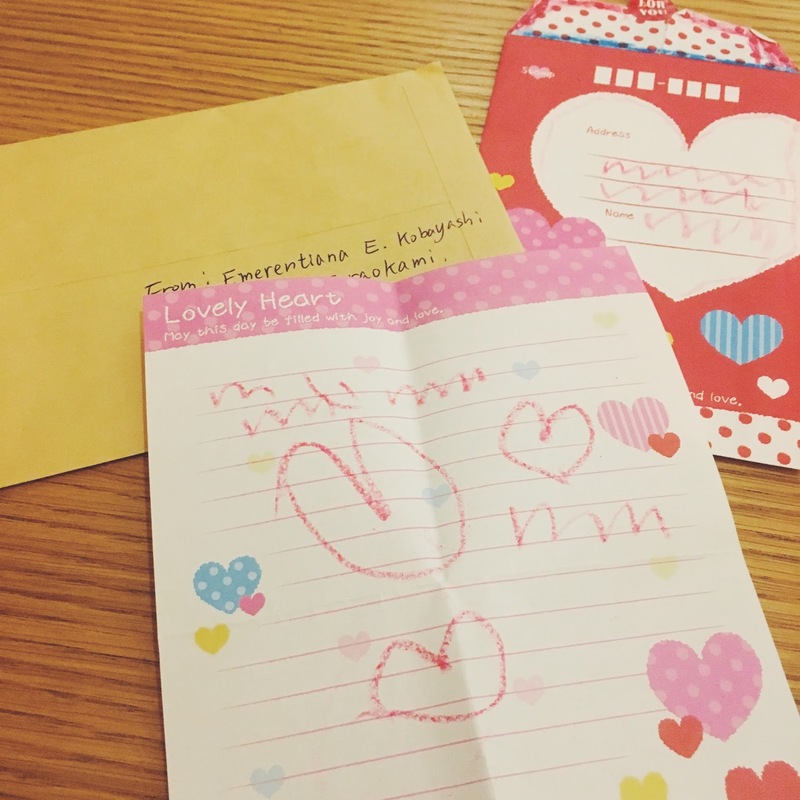 My god daughter Emi's love letter which her dad mailed from Japan to Taiwan. It's written in a language that only she can understand, but I assume it reads "Happy birthday, Ninang! I love you!" 2. I ordered milk tea to go with my pasta last week and found the cup... amusing annoying. Pwedeng all of the above ung last? Hehehe. 3. About to reach my savings goal for this year. Konting kayod pa at tipid tipid makakaraos din! 4. Skype date with my girl pals last Tuesday. We only had an hour to talk because of the Daylight Savings in Australia (3 hours time difference), so we had to "outline" and summarize what we had to discuss. 5. Not really an entirely happy thing that one of my friends is leaving Taiwan again, but I'm happy Marnie will finally be with his family and the love of his life. We had a small get together before he leaves on Saturday. 6. Long overdue Addiction Aquatic Development date with Hana, Erica and Addie (not in photo). Tambay in Family Mart for breaktime. Each brought a reading material they need to finish for their classes. I was just the one with nothing else to do. Hooray for working life hahaha. 8. I will miss taking night shots and sunset pictures from our office window. 10. I've been wanting to try this powder! Any reviews from those who have used it? I'm so happy to share this post with you! A couple of months ago, I wrote about my journey to finding a good dermatologist here in Taipei. I found a great doctor who helped clear up my skin after a few visits through oral and topical meds, and without any painful cortisone injection or extractions. I did not post a before and after photo at the time because my skin was so inflamed and the marks were still hideous. However, three months into the treatment and my skin has healed wonderfully. I started going to Dr. Shih in early August and have been under his care since. My skin care regimen now is very basic. I start off by cleansing with Cerave Foaming Cleanser, which I think does a better job than Cetaphil especially if you're on the combi or oily side. After cleansing, I pat my skin dry and wait for a few minutes before applying Clindamycin gel (green container from the photo below) from Dr. Shih's clinic. I wait for 30 minutes until my skin 'drinks' up the gel and then apply sunscreen (I use La Roche Posay Anthelios, in case you're wondering) before going to work in the morning. I no longer tone and I would sometimes skip moisturizing unless my skin is itchy and dry from the treatment. I was advised not to use moisturizer because my pores might get clogged again, but if there's a need to moisturize, the doctor suggests putting a very thin layer. I ran out of Physiogel Moisturizing Cream which I bought in Manila last time so I'm currently using Neutrogena Oil-Free Moisturizer for combination skin. It goes on light and is non-comedogenic. After 3 months, I'm happy to show you the progress (ackk so embarrassing to post the before photo!!!). The August photo was a lot less severe than what my skin looked like in June-July (imagine big painful spots on both cheeks). I thought I'd be needing laser therapy to lighten the scars, but I think the creams are doing a great job- slowly, but surely. My friend Billie visited Taipei over the weekend. It was her annual food pilgrimage, as she likes to call it. We planned a day trip to Taichung just to see the place as most of us have not been there. We booked our train tickets two weeks in advance, but still we were not lucky to score seats from Taipei to Taichung. It was a long weekend holiday so locals scrambled to get tickets online to head down south. We endured a two-hour train ride from Taipei to Taichung -standing- but it went by fast since we spent time catching up and talking about random stuff. We arrived past 10 in the morning and the cab we rented was waiting for us outside the train station. We had a pretty simple itinerary. We visited Rainbow Village 彩繪春村 to take a few snaps, then headed for late lunch at the first branch of the famous Chun Shui Tang 春水堂 (where pearl milk tea originated). We took a leisurely stroll along Fantasy Story 范特西 then made our way to Feng Chia Night Market 逢甲夜市. I was recovering from gastroenteritis so I didn't eat much night market food. Our driver dropped us at the Miyahara 宮原眼科 branch near the train station to buy some sun cakes and pineapple cakes. Yay for reserved seats on the way back to Taipei! Other memorable things on my list: Rex's birthday party and got to finally try the famous Fika Fika Cafe. Hope you're all having a happy October! I thought of ordering Filipino food to share with my friends for my birthday last Saturday, but things didn't go as planned. I had an appendicitis scare on Wednesday night after a horrible LBM which started the day before. I was having fever and had crippling pain on my right side. The symptoms reminded me of a friend who recently underwent an appendectomy, so I headed to Taipei Medical Hosp. Good thing I made it at 7:45, otherwise I will be directed to the ER at past 8pm. Funny thing was that the doctor did not quite understand what I was saying. I specifically asked for an English-speaking doctor when I registered, so I thought it was going to be ok. When I said I was having LBM, he typed "dyspepsia" and when he learned I'm from the Philippines, he immediately sent me to have a blood test for Hepa-C. Really?! I made a mental note that I'm not going to see this doctor again. I left the hospital with a pack of humongous antacids!!! I tried popping one and after just a few minutes my stomach started to rumble. I drank Sprite and water to replace lost fluids, and went to bed thinking it will just go away. Thank God we were on a typhoon holiday from Tuesday to Wednesday so I didn't have to skip work. The next day I woke up at 4am and it was the same scenario. I sent a message to my boss saying I need to go see a doctor (again). I tried so hard to find the name of the Filipino-Chinese gastroenterologist in Zhong Shan Hospital, who turns out to be my other doctor's husband. Good thing I can still recall how he looks when I ran into them in Costco. I had to match the photos one by one with the doctors' Chinese names online. I think I was the first patient he saw that day. I was so relieved when he said that what I have is gastroenteritis from the now-famous rotavirus here in Taiwan. He chuckled when I told him about my experience with the other doctor, it was an odd miscommunication he said. He prescribed some meds, checked if I have swelling on my right side, then he took another blood exam to confirm that it was not appendicitis. He gave me a list of what to eat and what not to eat for a week. He sent me off and he was even joking that I should avoid eating buffets for now ("no 吃到飽 okay?" hehe). So that was how I started my birthday celebration... an appendicitis scare, a trip to the doctor, and a week of 'clean eating' (no birthday cake for the birthday girl). Friends and colleagues tried to keep me alive by sending over food and fruits (I could only eat apple so I had tons of apple in the fridge). I alternated lugaw, white bread, plain rice with soup and ma-hu for almost a week. Thank you, church family, friends and colleagues for celebrating with me and for eating all the cakes! But the best birthday present I received from the heavens (apart from my 28th year of life here on earth) was the approval of my permanent residency here in Taiwan... finally after 7 long years and one month (today to be exact). It was mailed to me the same day I went to the hospital, and I received it two days after my birthday. I was in tears when I opened the mail... I felt all the hard work, will and determination that came with the piece of plastic card. Thank You, Lord for everything!!! I prayed for this so hard (harder than I do for prince charming to find me, because #priorities first hahaha) and asked all of my close friends to join me in prayer.